Irrigation will receive the highest investment priority and all on-going projects will be completed according to a strict time schedule. A special technology and extension programme for dry land farming will be introduced. Farmers all over the country will receive fair and remunerative prices and government agencies entrusted with the responsibility for procurement and marketing will pay special attention to farmers in poor and backward states and districts. 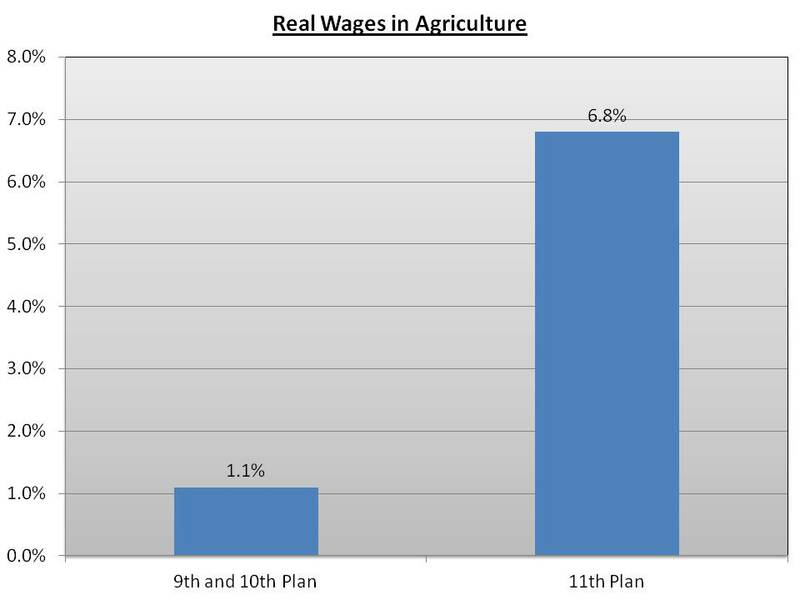 To ensure the fullest implementation of minimum wage laws for farm labour. A comprehensive protective legislation will be enacted for all agricultural workers. Revenue administration will be thoroughly modernised and clear land titles will be established. A forward a Constitutional Amendment to ensure the democratic, autonomous and professional functioning of cooperatives. 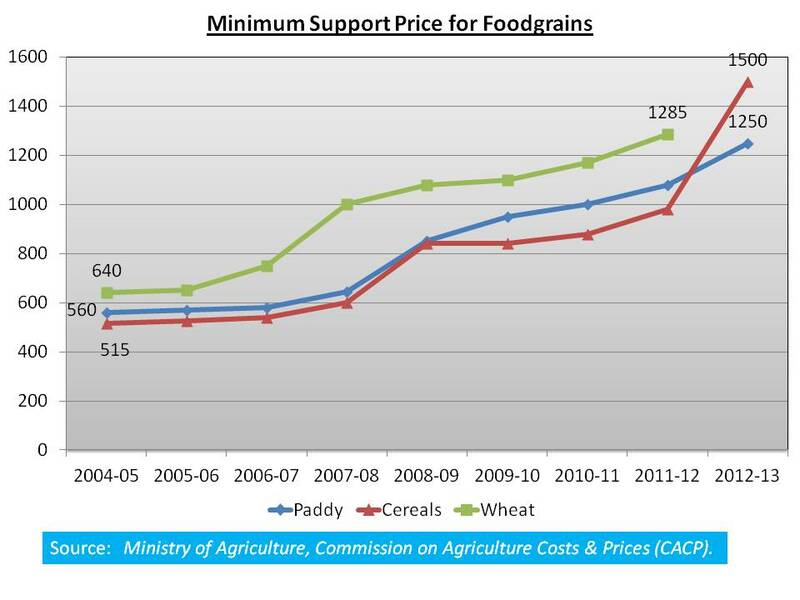 Controls that depress the incomes of farmers will be systematically removed. Farmers will be given greater say in the organisations that supply inputs to them. 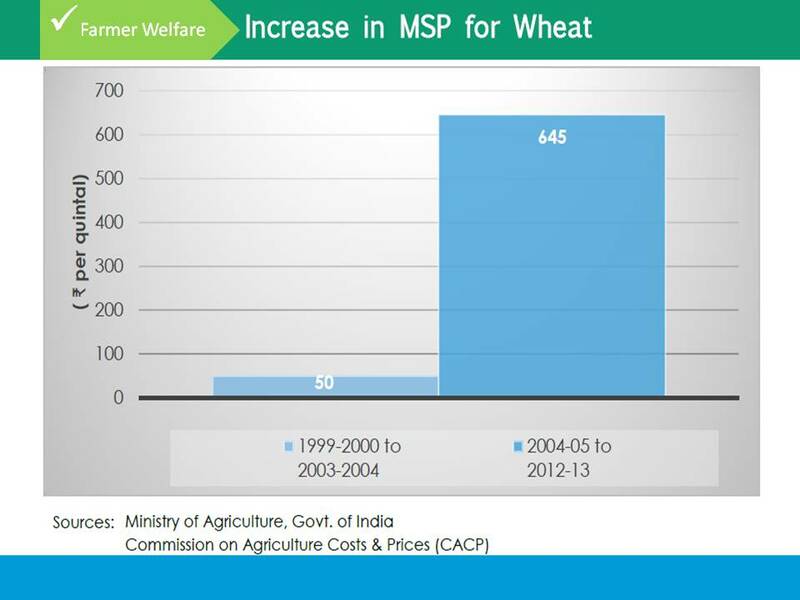 The UPA Government will ensure that adequate protection is provided to all farmers from imports, particularly when international prices fall sharply. 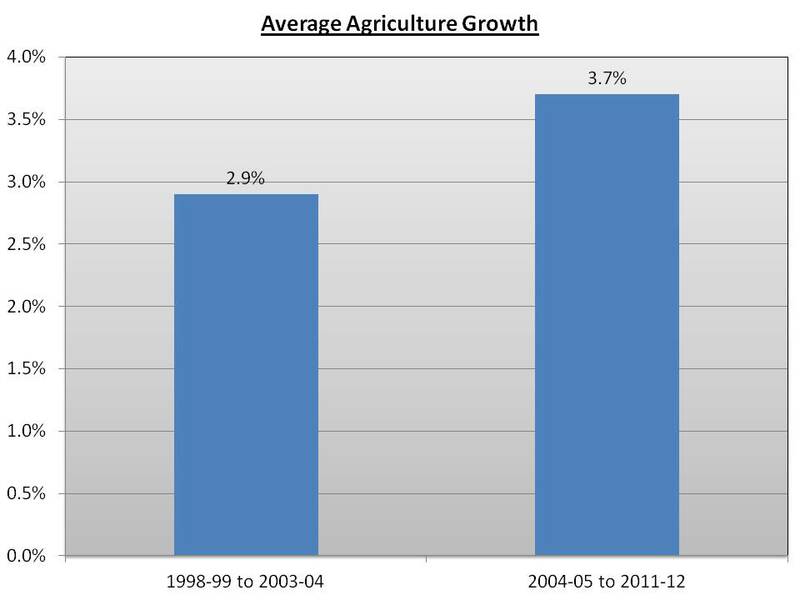 The terms of trade will be maintained in favour of agriculture. Pledge to extend interest relief to all farmers who repay bank loans on schedule. The special needs of crops like tea, coffee,rubber, spices, cashew and coconut will be met. Firmly committed to ensuring that farmers get, at a very minimum, market rates for the land that is acquired for industrial projects. The Land Acquisition Rehabilitation and Resettlement Bill will be passed to ensure that the interests of land-owners are more than adequately protected. 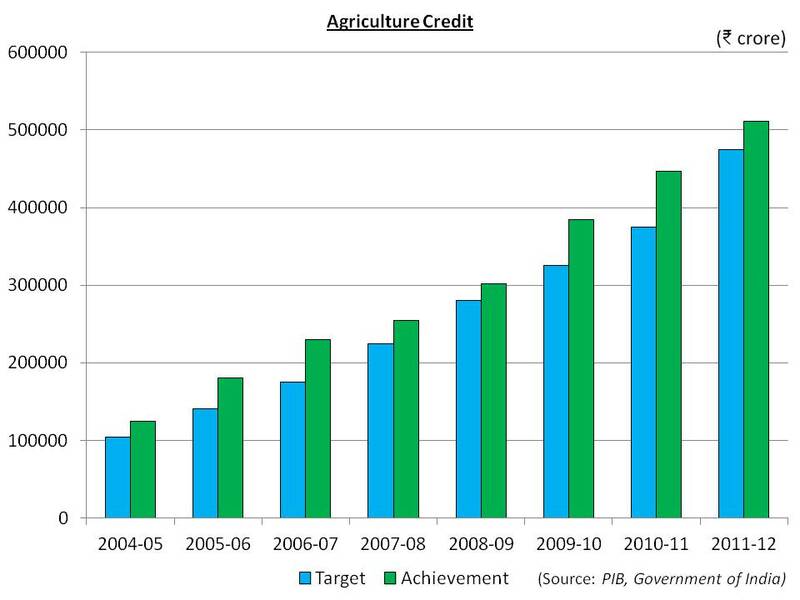 Agricultural credit is the driver of agricultural production. 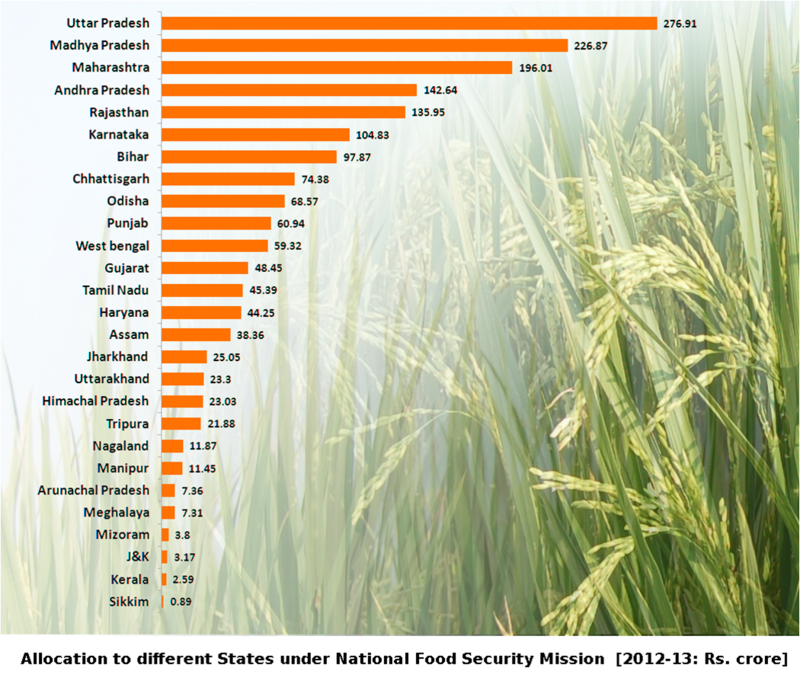 India will exceed the target of Rs575,000 crore fixed for 2012-13. Budget 2013-14 proposes to increase the target to Rs700,000 crore. The interest subvention scheme for short-term crop loans started, and a farmer who repays the loan on time will be able to get credit at 4 percent per annum. 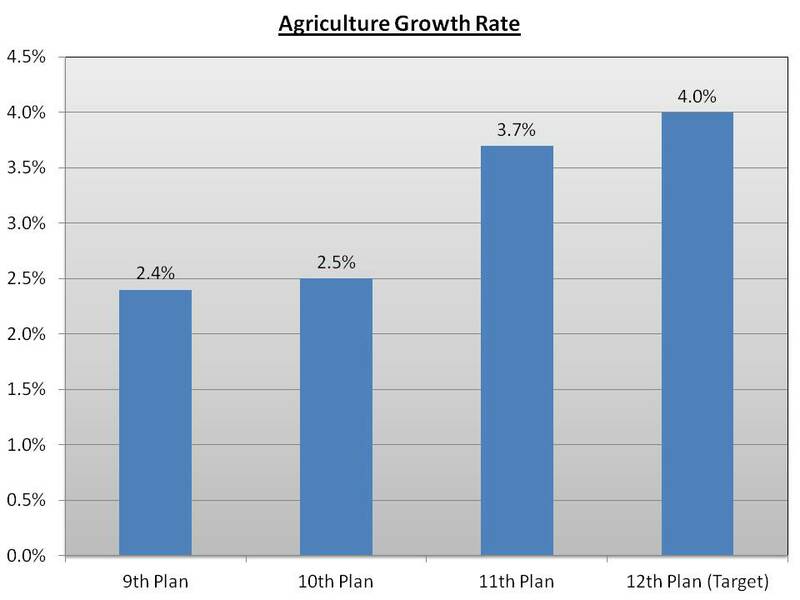 National Horticulture Mission – As of 2012, Per capita availability of fruits and vegetables has increased to about 169 gms/person/day and 332 gms/person/day respectively. National e-Governance Plan in Agriculture (NeGP-A) has been launched, which is helping raising farm productivity and income to global levels through provision of relevant information and services to stakeholders. 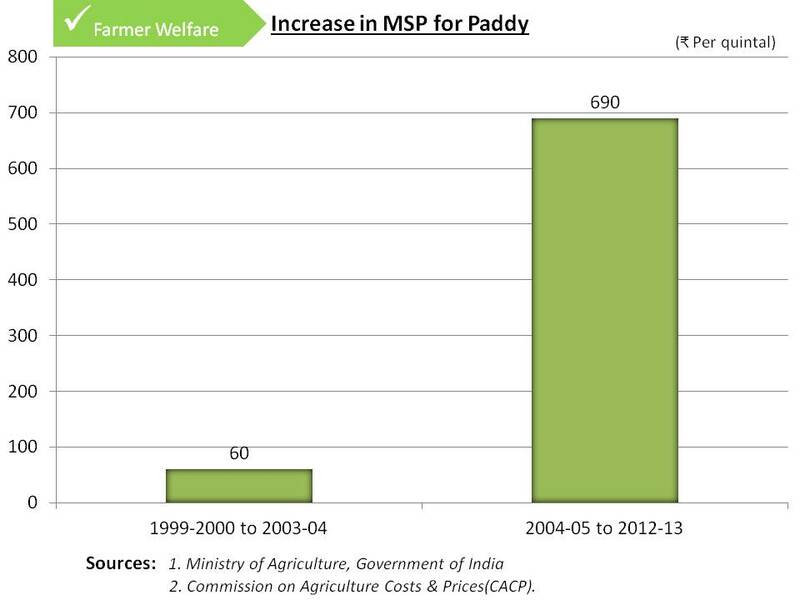 The Government has approved the National Dairy Plan Phase-I to be implemented during the period 2011-12 to 2016-17. The scheme is being implemented for increasing productivity of milch animals. The UPA Government has introduced weather / rainfall insurance with 50% Government subsidy for small coffee-growers. Production of pulses and oilseeds is estimated at 17.28 million tonnes and 30.53 million tonnes respectively. Goatery development, an amount of Rs297.50 crore was released to States National Mission on that was launched in 22 States as a part of Rashtriya Krishi Vikas Yojana. Livestock Insurance Scheme was launched in 2006 to with the twin objectives of providing protection to the farmers and cattle rearers against any eventual loss of their animals due to death and to demonstrate the benefit of the scheme to the people and popularize it with the ultimate goal of attaining qualitative improvement in livestock and their products. 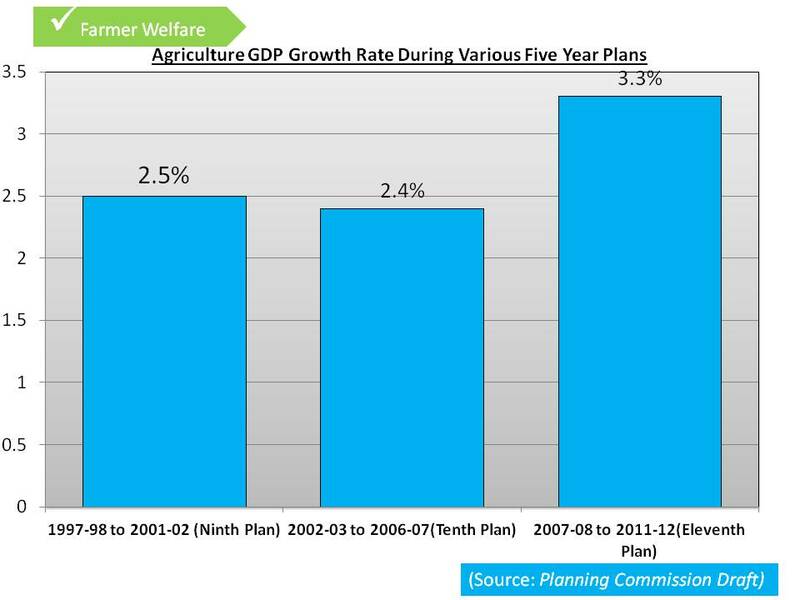 In 2009, UPA approved the implementation of Centrally Sponsored Scheme, “Poultry Development”. The ‘Rural Backyard Poultry Development’ component is expected to cover beneficiaries from Below Poverty Line to mainly enable them to gain supplementary income and nutritional support. The National Rainfed Area Authority has been established to foster harvesting, conservation and sustainable and equitable use of rainwater and will implement the Rainfed Area Development Programme from this year. community in 22 languages from 6.00 am to 10.00 pm on all 7 days of the week. 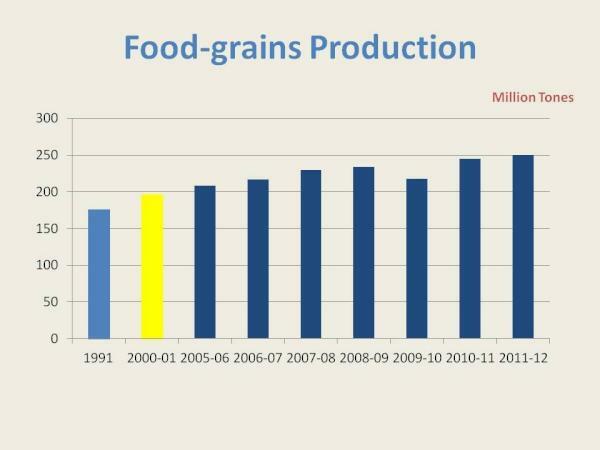 The Production of wheat has increased from 75.81 million tons in 2006-07 (pre-NFSM year) to 94.88 million tons during 2011-12, i.e. nearly 19 million tons against the envisaged target of 8 million tons. The production of rice has increased from 93.36 million tons in 2006-07 to 105.31 million tons in 2011-12 with an increase of nearly 12 million tons against the target of 10 million tons. The total production of Pulses has also increased from 14.20 million tons during 2006-07 to 18.24 million tons during 2010-11, with an increase of 4 million tons against the target of 2.0 million tons. 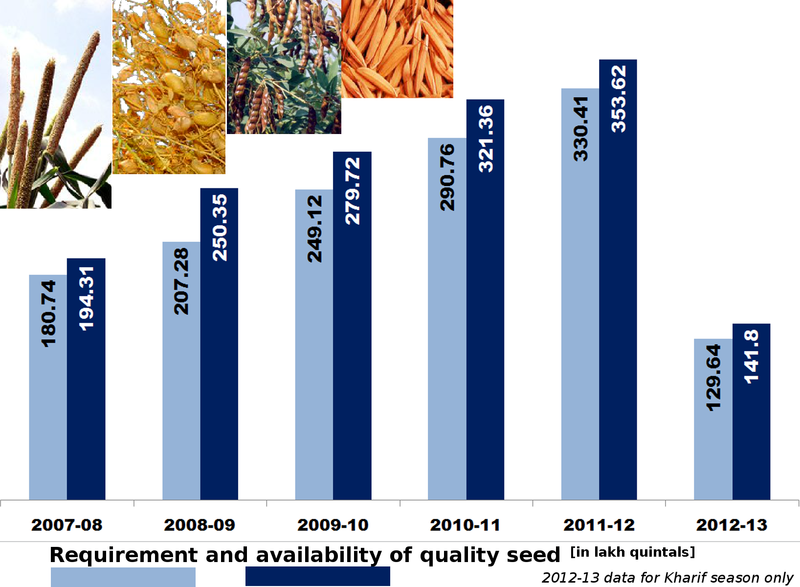 During 2011-12, production of 17.09 million tonnes of pulses was achieved.